There’s a land grab happening right now in podcasting. Talent is being acquired at a startling rate and most recently, Spotify announced that it has spent in the region of $280m, equal to almost 90% of the entire 2017 podcasting industry ad revenue on acquiring Gimlet Media and Anchor (sale price TBC but perhaps around $50m according to PodNews), whilst Himalaya just announced a $100m funding round in order to really break into the U.S. podcasting market. Make no mistake, this is a land grab. Actually no, it’s a talent grab. Spotify’s announcement points to the acquisition of talented people who can make great things, be they content pieces via Gimlet or technology pieces via Anchor. Himalaya, on the other hand, will likely throw some cash at “top” podcasts or creators in order to bring them into some type of exclusivity deal with the platform in the short-term. Regardless of your opinion of this, or if this even really IS “podcasting” as we know it, the fact of the matter is that this IS happening to our industry and despite this new, “podcasting 2.0” not necessarily looking like the podcasting of yesterday, when the dust settles, it won’t matter: audiences must grow, the industry must grow, revenues must grow and new listeners don’t care what it’s called – they want their audio when they want it, where they want it and on their terms. The race that is happening now is actually kind of boring when you think about it, though. Both Himalaya and Spotify are simply striving to become the biggest content players in this field in the short-term and fine, let them and others duke that out for a while and let’s see what plays out. The long-term is what I’m interested in – how will the marrying of two outstanding tech-stacks at Spotify affect what they can do, and what ground-breaking content will the Gimlet creators dream up to take advantage of that tech? There’s money being poured into the industry and that’s making it to the mainstream news channels, at least here in the U.K., which is a win for the industry at large. And there’s simply no denying that revenue is key to Spotify and Himalaya, with Himalaya moving into that space with their “tipping system” (which isn’t something only they do, by the way) and Spotify moving to one-two punch the industry by creating new content which will likely have a back end powered by Anchor’s ad/targeting tech. Regardless of what Spotify decides to do with Anchor’s creator tech, especially given that Spotify focusses on quality of audio whereas Anchor allows anyone to produce content regardless of quality, consistency or planning, it’s clear that Anchor’s tech stack will be integrated into Spotify in various ways that will only really become clear over the next few years. What is refreshing about the Spotify release is that the focus is on one thing: audio. Spotify wants to own that eco-system just like YouTube owns the online video eco-system for creators and Netflix for higher-production-value consumer-based content. And, to credit my friend Evo Terra, Spotify is good at audio and it’s great at making audio accessible to new listeners – a problem that podcasting has continued to face for a long time now. Sure, Spotify won’t get this right immediately but it’s a bold, strong and exciting move for the industry. I listen to all of the podcasts that I subscribe to via Spotify and honestly, which listener really cares that it’s not “podcasting” in its purest form because technically, Spotify is a streaming platform versus a download-based platform? Sure, WE care in the industry – but that’s been half the challenge for podcasting recently, the incumbents are choosing the wrong hills to die upon rather than innovating. It’s this lack of real innovation from the “OG” podcast companies that brings me to the biggest culprit of them all: Apple. Only a couple of years ago, Apple redesigned its podcast app and gave us all some brand new tags to use within our shows, such as the “bonus” episode tag and more. But then, they proceeded to do nothing with it. I’ve long held the belief that Apple has something up its sleeve for podcasting and as we know, the company is working on a content platform in order to try to mount a challenge to Netflix – will this be an all-encompassing platform that brings in music, audiobooks, podcasts and more? Apple certainly has the eco-system to do it and moving forward with a complete content solution like this will go a long way to solving the fragmentation issues that the company has created for itself by making the choice to split its music, podcasting and video offerings into different apps. The truth is though that regardless of what Apple does, there’s always the question of whether the company waited too long to do anything for the podcast industry that it was central to creating all those years ago. Podcasters and the industry have become disenchanted by Apple in recent years because their baby has been left wanting. But from Apple’s perspective, I understand that. I had a chat with another friend, James Cridland from PodNews.net, one November morning over a coffee and we got to discussing that, given the revenue running through podcasting right now it’s simply not worth Apple’s time to do anything much in the space. For context and with the caveat that we know Apple is having some revenue challenges right now, the company reported $53.3 billion revenue for the quarter ended June 2018. That’s approximately $4.4 billion per week, which brings the podcast industry’s annual ad revenue figure from 2017 of $314 million and even the potential industry ad revenue as posited by the same TechCrunch article of $659 million by 2020, into some extremely stark and not-so-welcoming light. Not for Apple, anyway. It simply makes no business sense for Apple to invest time and resources into an industry that just doesn’t move the needle for it, even despite Apple’s perceived obligations to the medium. Meanwhile, as predicted by and to paraphrase Nathan Baschez, the indie podcasting industry incumbents will do what they’ve been doing for the last few years now – defending their position instead of innovating in the space. There is an unseen benefit to Spotify’s new podcasting focus, too. Giving full credit here to James Cridland for bringing the idea to my attention, Apple is actually the biggest threat to podcasting. By owning the API that so many of the world’s “other” podcast listening apps draw their data from, Apple has managed to retain its spot as the defacto “home” of podcasting and if that API was to go away, the industry would be at a huge loss. Whilst Apple isn’t a malevolent threat to the industry because of this and it’s certainly not “by design”, by virtue of so many external apps relying upon one, sole API it can be posited that there is a threat to the industry due to the pure lack of actual decentralization. 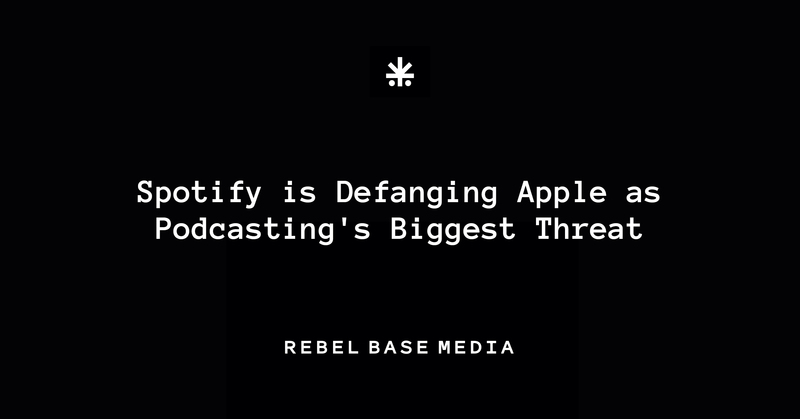 But that potential threat has been defanged, the mitigation has begun because players like Spotify and Pandora have their own, complete eco-systems that, whilst reliant on RSS technology right now, may not be reliant on it in the future and this actually allows the industry other options outside of the closed, slow-moving Apple eco-system. There are so many opinions for how Spotify will use Gimlet and Anchor, but right now none of that matters – we can enjoy the ride and begin to think even bigger because Spotify is going to be raising awareness of our industry for us, which isn’t a bad thing, is it. Hit me up on Twitter if you want to chat on this: @MrAsquith.